96 F. Supp. 824 (S.D. Cal. 1950); 190 F.2d 506 (9th Cir. 1951); certiorari granted, 342 U.S. 932 (1952). A U.S. citizen owes allegiance to the United States and can be punished for treason, regardless of dual nationality or citizenship, and irrespective of country of residence. Frankfurter and Clark took no part in the consideration or decision of the case. 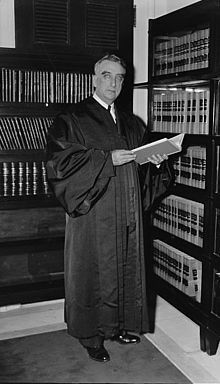 Kawakita v. United States, 343 U.S. 717 (1952), is a United States Supreme Court case in which the Court ruled that a dual U.S./Japanese citizen could be convicted of treason against the United States for acts performed in Japan during World War II. Tomoya Kawakita, born in California to Japanese parents, was in Japan when the war broke out and stayed in Japan until the war was over. After returning to the United States, he was arrested and charged with treason for having mistreated American prisoners of war. Kawakita claimed he could not be found guilty of treason because he had lost his U.S. citizenship while in Japan, but this argument was rejected by the courts (including the Supreme Court), which ruled that he had in fact retained his U.S. citizenship during the war. Originally sentenced to death, Kawakita's sentence was commuted to life imprisonment, and he was eventually released from prison, deported to Japan, and barred from ever returning to the United States. Judge Mathes's instructed the jury that if they found that Kawakita had genuinely believed he was no longer a U.S. citizen, then he must be found not guilty of treason. During the course of their deliberations, the jury reported several times that they were hopelessly deadlocked, but the judge insisted each time that they continue trying to reach a unanimous verdict. In the end—on September 2, 1948—the jury found Kawakita guilty of eight of the thirteen counts of treason against him, and he was sentenced to death. :155–156 As a consequence of his conviction for treason, Kawakita's U.S. citizenship was also revoked. :431 In passing sentence, Mathes said: "Reflection leads to the conclusion that the only worthwhile use for the life of a traitor, such as this defendant has proved to be, is to serve as an example to those of weak moral fiber who may hereafter be tempted to commit treason against the United States." Kawakita appealed to a three-judge panel of the Ninth Circuit Court of Appeals, which unanimously upheld the verdict and death sentence. Certiorari was granted by the United States Supreme Court, and oral arguments before the Supreme Court were heard on April 3, 1952. Associate Justice William O. Douglas wrote the opinion of the Court in the Kawakita case. In a 4–3 decision issued on June 2, 1952, the Supreme Court upheld Kawakita's treason conviction and death sentence. The Court's opinion was written by Associate Justice William O. Douglas, joined by Associate Justices Stanley F. Reed, Robert H. Jackson, and Sherman Minton. Chief Justice Fred M. Vinson wrote the dissent in the Kawakita case. On October 29, 1953, President Dwight D. Eisenhower commuted Kawakita's sentence to life imprisonment plus a $10,000 fine. After the commutation of his sentence, Kawakita was transferred to the Alcatraz Federal Penitentiary. Ten years later, on October 24, 1963, President John F. Kennedy—in what would be one of his last official acts before his assassination—ordered Kawakita released from prison on the condition that he leave the United States and be banned from ever returning. Kawakita flew to Japan on December 13, 1963, and reacquired Japanese citizenship upon his arrival. :431 In 1978, Kawakita sought permission to travel to the United States to visit his parents' grave, but his efforts were unsuccessful. :431–432 As of late 1993, he was living quietly with relatives in Japan. ^ a b c d e f Shibusawa, Naoko (2006). America's Geisha Ally: Reimagining the Japanese Enemy. Harvard University Press. pp. 140–175. ISBN 978-0-674-02348-2. ^ a b c d Chuman, Frank F. (1976). The Bamboo People: The Law and Japanese-Americans. Del Mar, California: Publisher's Inc. pp. 288–290. ISBN 0-89163-013-9. ^ a b c d Kim, Hyung-chan (1994). A Legal History of Asian Americans, 1790–1990. Westport, Connecticut: Greenwood Press. pp. 125–126. ISBN 0-313-29142-X. ^ a b "Not Worth Living". TIME Magazine. October 18, 1948. Archived from the original on May 24, 2013. Retrieved August 2, 2015. ^ a b c "POW Camp Atrocities Led to Treason Trial". Los Angeles Times. September 20, 2002. Archived from the original on 2015-01-03. Retrieved August 2, 2015. ^ a b c Kelly, H. Ansgar (1992). "Dual Nationality, the Myth of Election, and a Kinder, Gentler State Department". University of Miami Inter-American Law Review. 23: 421–464. Archived from the original on 2016-03-04. Retrieved 2015-08-02. ^ Tomoya Kawakita v. United States, 190 F.2d 506 (9th Cir. 1951). ^ Kawakita v. United States, 342 U.S. 932 (1952). "Certiorari granted." ^ a b c d e Kawakita v. United States, 343 U.S. 717 (1952). ^ a b "Eisenhower Spares Life of U.S. Traitor" (PDF). New York Times. November 3, 1953. Archived (PDF) from the original on 2016-03-04. Retrieved August 2, 2015. ^ "Kawakita, War Criminal, in Tokyo as a Japanese" (PDF). New York Times. December 13, 1963. Archived (PDF) from the original on 2016-03-04. Retrieved August 2, 2015. This page was last edited on 14 January 2019, at 22:27 (UTC).